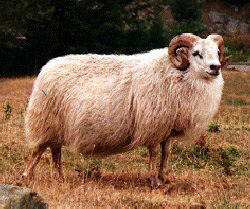 The modern Icelandic Sheep is a direct descendant of the sheep brought to the island by the early Viking settlers, in the ninth and tenth century. It is of the North European Short Tailed type, related to such breeds as the Finnsheep, Romanov, Shetland, Spelsau sheep and the Swedish Landrace, all of which are descendants of this type of sheep which was predominate in Scandinavia and the British Isles during 8th and 9th century. Of these the Icelandic and the Romanov are the largest, classified as medium size. Very few attempts have been made to "improve" the Icelandic sheep through the centuries with outside crossings. The few attempts that were made, resulted in disasters brought on by diseases brought in by the "new blood". As a result producers drastically culled all animals which were results of crossbreeding. As a consequence all effect of other breeds was eliminated. It is now illegal to import any sheep into Iceland. As a result of these factors improvements to the breed have been done by selective breeding within the breed itself. Genetically the Icelandic sheep is the same today as it was 1100 years ago. It is possibly the oldest and purest domesticated breed of sheep in the world today. The Icelandic sheep are of medium size with mature ewes weighing 150-160 lbs. and rams 200-220 lbs. They are fine boned with open face and legs and udders. The breed has both polled and horned individual of both sexes but it is primarily horned. Icelandic sheep are not particularly tall but broad and have an excellent conformation as a meat breed. They are seasonal breeders, the ewes start to come into heat around early November, lasting through April. By early October the mature rams develop a distinct odor which stimulates breeding activity in the ewes. The odor remains with the rams through the breeding season. This smell will also have an adverse effect on meat quality if mature rams are slaughtered during that period. Occasionally the Icelandic sheep will breed out of season but that has not been encouraged in Iceland. The fecundity in the ewes is excellent and the mature rams are very efficient breeders. Lambing rate is a approximately 170-180%, with increases possible through more intensive management. They are early maturing and the ewes can easily lamb at 12 months of age. Ram lambs can start breeding around seven months old. Life expectancy is long, healthy ewes commonly lambing until they are 12 to 14 years old in Iceland. The wool is dual coated and comes in many natural colors, even though the white color is most common. Recently a major gene effective prolificacy has been identified in the Icelandic breed. The gene is called "Thoka" after the ewe Thoka, born in 1950 at Smyrlobjoerg farm, from which it is thought to originate. This gene exhibits action similar to the gene found in the Booroola Merino. Researchers have observed marked differences in ovulation rate between carrier animals and non-carrier animal. On the average non-carriers were found to have 1.59 - 2.2 ova, with carrier animals showing 2.14 - 3.4 ova, a statistically significant difference. To date (1996) research has only been conducted using heterozygous carriers of the gene. The Icelandic breed is not a docile breed. They are alert and fast on their feet. Most of them are very individualistic and flocking instinct is poor. They tend to spread out which makes them good users of sparse pasture. They are good browsers and seem to enjoy eating brush and wild grasses. The ewes are good mothers and high milk producers which is not surprising considering they were also used as milk animals until the middle of the twentieth century. It has been reported they are aggressive toward other sheep and will usually dominate in those situations. Behavior in Icelandic sheep has been compared to that of feral or early domestic animals. Some are nervous but when they get to know their shepherd they get quite friendly. The dominant ram, usually a horned one, can get possibly dangerous. The breed is famous for its wool around the world, but in Iceland it is bred almost exclusive for meat. More than 80% of the income from them in Iceland is from meat. Though the lambs are born small, they grow fairly fast. On good pastures they should reach 80-90 lbs in 4-5 months, at which time they are weaned. The average growth rate is 250-300 g/day (10-12 oz/day). These lambs are not fed any extra grain or creep feed but are slaughtered straight off mountain pastures. Dressing percentage is around 45%. The meat are fine grained and has excellent flavor. Dr. Clair Terrill has stated that Iceland is among the top countries in meat produced per sheep kept. Even though the wool counts for little of the income from sheep in Iceland (less than 15%) it is the wool for which they are know. The fleece has an inner and outer coat typical of the more primitive breeds with the fine undercoat being called Thel) and the long, coarser outercoat called Tog. The fleeces are open and not very greasy. The average fleece weighs 4-5 lbs. in grease. 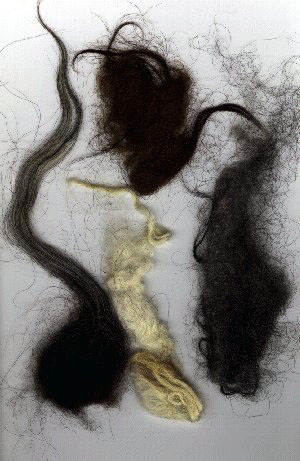 Due to the length of fiber, the openness of the wool, the natural colors and the versatility, fleeces are usually sold through specialty markets to handspinners. The thel is down like, springy, lustrous and soft. The longer tog coat is similar to mohair, wavy or corkscrewed rather than crimped and is wonderful in worsted spinning. At present this wool is not suited for the industrial market in North America, both because of how rare it is and also because of its unique nature. The natural colors vary from snow white through several shades of grey to pitch black as well as several shades of morrit to brownish black. Some individuals will also show mouflon, badgerface patterns with several combinations of color and patterns. Bi-colored individuals are also fairly common. The skin of the Icelandic sheep is excellent as a pelt skin. That is in part due to how relatively few hair follicles they have. Fashion clothing, mostly coats, have long been manufactured from the pelts. These items usually demand a high price on the world market. The skins are also sold as sheepskin rugs that are absolutely gorgeous. Fahmy, M.H. and G.H. Davis. 1996. Breeds with Newly Discovered Genes for Prolificacy. Chap 3.11, Prolific Sheep. (M.H. Fahmy, ed. ), CAB International, University Press, Cambridge 542 pp. Stefania Sveinbjarnardottir-Dignum, Yeoman Farm, Parham, Ontario, Canada.